Ah, the season is upon us once again. Many of you probably celebrate the Christmas holiday or some variation of it. If so, it is quite likely that you are well schooled in all things Santa Claus. You know the stories. You’ve sat on laps and tugged on beards. You’re down with the “ho, ho, ho.” You’ve done a few turns around the block on Candy Cane Lane. You know the drill. But what about Santa’s compadres? I’m talking about that elite, nine reindeer team that makes the magical mystery tour every year, pulls the heavy sleigh and circles the globe and back to deliver toys on target and on time for Christmas morning. They fly over our houses and commit indiscretions on our rooftops. They even make a handful of public appearances now and then. But we still know relatively little about this enchanting and enigmatic team, even thoug. It’s high time we got to know these reindeer a little better. I did a little poking around and was able to come up with the following. Contrary to his name, Dasher does not dash. Nor does Dasher scurry, hurry or do anything quickly. In fact, Dasher is quite the opposite. Dasher is in a perpetual state of slow motion. He moves at the speed of mud. 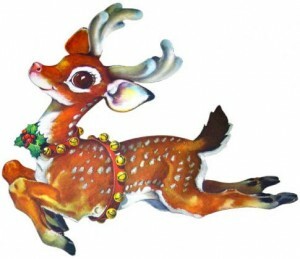 He often oversleeps and is usually the last reindeer out of bed. He’s chronically late. Dasher drives everyone a little batty with his painfully slow way of being in the world. It takes Dasher forever to make the simplest of statements. His impatient friends often finish his sentences for him. Dasher was originally named Diamond, but Santa changed his name in the hopes that it would motivate him to pick up the pace in all areas. Sadly, this tactic didn’t work. It’s a bit of a mystery as to how Dasher keeps up with the rest of his teammates on Christmas Eve. The North Pole keeps this information confidential, but rumor has it that a significant amount of espresso is involved. There is no question that Vixen enjoys milking the celebrity that comes with being one of Santa’s reindeer. A good-looking bull with an impressive rack of antlers, Vixen is known for his swagger and night-on-the town shenanigans. He runs with a glamorous pack of furry A-listers including Bullwinkle and former child star Bambi. In spite of his bad boy image, Vixen is highly regarded by Santa. His speed and precision on Christmas Eve make him a strong asset to the team. In addition, Vixen is always willing to smile for the camera and frequently lends a hoof to multiple charitable organizations. Comet is all about baking and astrology. He is forever in the kitchen with Mrs. Claus, trying out new recipes. He’s often seen buzzing around the North Pole with a platter of freshly baked cookies or a basket of hot muffins. He likes for his reindeer friends to try out his latest creations, somewhat to Santa’s consternation. (During the months of October, November and December, Comet is not allowed to distribute goodies to his reindeer teammates as they are on a strict pre-flight diet and workout regimen.) Comet is fanatical about astrology, reading horoscopes and such. He often greets new people and animals with: “What’s your sign? Want a cookie?” Comet’s intuitive connection to the cosmos and beyond has been invaluable for Santa when planning the Christmas Eve route year after year. Donner is the oldest member of the team. A bespectacled senior, Donner is believed to be a few hundred years old, although nobody knows for certain. Donner usually has a book in hand and is decidedly more interested in working on the crossword puzzle than joining in any reindeer games. Every year, Donner crankily exclaims, “I’m too old to pull that damn sleigh around the world again.” But with a good dose of ibuprofen and some cajoling by Santa, Donner is always convinced to make the trek “one more time” and continues to show up for duty every Christmas Eve. Cupid definitely lives up to his name as his matchmaking escapades are well known around the North Pole. With a heart full of sunshine, Cupid optimistically believes that there is “someone for everyone” and that he can find the perfect sweetheart for anyone he tries to help. Sadly, Cupid’s confidence, at times, has exceeded his abilities. He once fixed a gingerbread girl up with a snowman. Unfortunately, when the relationship began to heat up, the snowman melted, and the devastated gingerbread girl was left with a mere puddle for a paramour. Another time, Cupid offended Prancer when he tried to fix her up with a donkey from a nearby Nativity scene. “I don’t care if he stands around next to Baby Jesus all day, “ she bemoaned, “He still has bad teeth and stinky breath.” Despite his misses, Cupid remains upbeat. He hopes to one day start an online dating service that caters exclusively to elves.